How a young mother advocated for her son, getting him bilateral implants and Auditory-Verbal Therapy, and raised awareness in a health care system focused on containing costs. Newborn hearing screening didn’t exist in France in 2007, so my son Matthieu’s hearing loss was not diagnosed at birth. Because he was my second child I had doubts on his hearing abilities very soon, and Matthieu was diagnosed with a bilateral hearing loss at 5 months. He received his hearing aids right away and he started all the tests in case he would need a cochlear implant. I started to search for information on the Internet, and to ask questions of the doctors. Everything that I found in French depressed me. I was on the verge of accepting that Matthieu would never be able to speak properly, and that he would have to go in a deaf institute far from home. The doctors told me not to expect too much of the cochlear implant. There was just one French forum where I could share my feelings with parents. And even though they answered my questions, they all told me that Matthieu would have to sign or to use cued speech, and that made me uncomfortable. I didn’t want to place any limitations on my child. I felt that he would have to learn to listen and speak to reach his true potential. Then I looked at websites in English. There were SO many! There were blogs by parents, speech therapy websites, and more. I read everything eagerly. But what struck me was the websites created by the manufacturers. In French or in English the information was not the same AT ALL! They all talked about the products, deafness, there were testimonies. But, Cochlear, Advanced Bionics and MED-EL all had Auditory Verbal Therapy (AVT) pages on their American websites, while they were not available on the French versions. Cochlear Americas had a whole page about bilateral implants with studies. A lot of parents were talking about their children “being bilateral” and the way it changed their hearing abilities. Most of all, I could see videos where I could hear them, and they were outstanding! Thanks to those parents and to the professional websites I knew exactly what I wanted for Matthieu: simultaneous bilateral implant surgery and Auditory Verbal Therapy! The closest implant center didn’t want to do a simultaneous bilateral surgery, probably because it was considered too costly, so I looked for another one. Fortunately, another nearby center in Tours was starting a study on bilateral implants and they accepted Matthieu. In the meantime, I read all I could about Auditory Verbal Therapy, I ordered books (all in English, nothing was in French), and I spent hours at night on the Internet trying to find tips to teach my son to hear and speak. I was still trying to find a professional in France ready to try AVT. I called French speech therapists, schools, and CI centers. No one seemed to know about AVT, but the saddest was that no one seemed interested in learning what it was. I realized that if AVT was what I wanted, then I would have to do it myself! At 7 months, Matthieu offered me the most wonderful gift: as I was in the kitchen, I heard him call “Maman” from his bed. When he saw me, he took a deep breath and said MAMAN with a huge smile. He never stopped calling me since then. At this moment I KNEW that I had made the right choice. 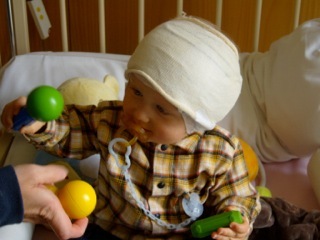 At 8 months Matthieu lost his residual hearing and it became obvious that only a cochlear implant could help him. He was finally bilaterally implanted with 2 Cochlear devices at 14 months in October by the surgeon in Tours (1½ hours away from home). We waited two weeks for activation. Matthieu couldn’t hear a thing, but he was not silent at all. In the meantime, I kept reading blogs and books. One day before activation I found a professional website dedicated to AVT. Therapists posted tips, studies, and exercises. And, at the bottom of one page, there was a name, and an e-mail address. I immediately decided to e-mail this AV Therapist and ask for help, because I knew that once Matthieu could hear he would need much more than what I had done so far. And I needed a professional to help me. Why her and not one of her colleagues? Why did I decide to ask for her help at just that moment? Three and a half years later I still don’t know. I explained I was French, and that I needed help to educate my son. Could she please answer a few questions? Give me some tips? The answer came a few hours later: “I am so excited, we can try AV sessions on Skype !” One answer and Matthieu’s life was changed forever! Matthieu was activated the next day, but our challenges were not over yet. That’s exactly when I started to encounter some resistance, because after the first appointment I met the therapist on Skype for the first time. She explained to me what I needed to ask the audiologist: 20dB on all frequencies within 3-4 weeks. Matthieu was 14 months old and had to catch up quickly. When I said that to the audi, he just stared at me, and calmly said: “20dB? That is unnecessary! Look, 20 dB is a quiet room, Matthieu doesn’t need to hear that. But, we can try to reach 35dB in 10 months.” That left me speechless! I kept searching for information on the Internet, and I sent an e-mail to a cochlear implant center in London. I wanted to know if they would be willing to program my son’s processors. They gave me an appointment for a whole week-long session in February: 3 months post activation. When the English audiologist saw Matthieu’s MAPs, she just said “hmm, they are unusual.” After one week in London, Matthieu’s hearing was so different. He could hear everything, and he started to babble more and more. When the French CI center discovered that we had gone to London, they decided not to treat Matthieu anymore. Matthieu started talking 6 months post London MAPping, so we kept going to London every 6 months. In 2010, almost 2 years after surgery, we flew to Utah for a 6-week auditory verbal summer session, but also for MAPping sessions. When we came back, my little boy couldn’t stop talking both in French and English. The American audiologist made real performing MAPs. Matthieu could hear everything, even from a different room! 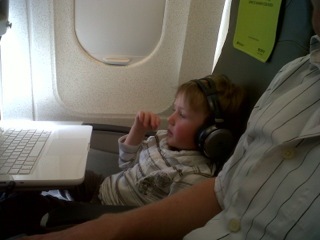 In September 2010 our American Skype AVT therapist dismissed my son. After 2 years, he was AV graduated. 2 years when all the French speech therapists told me they would see Matthieu at least until high school. Due to the European financial crisis, the center in London couldn’t keep programming Matthieu’s implants, so we had to find another center willing to follow what had been done in Utah. It’s finally in Barcelona, Spain, that we have found the right place. I tried to contact some other French audiologists, but, we found it was difficult for the French audiologists to accept that we were having the mapping done abroad, and I came to understand that we had found our way onto a “blacklist” – in France the medical community is very small. I knew that a good MAP was essential to Matthieu’s success, so we did what was necessary in order to help him hear his best, even if we had to make financial sacrifices and burn some bridges to get there. We now go to Spain once a year, and Matthieu participates fully in his sessions. He has more than the vocabulary needed to explain what he hears. He is mainstreamed, and he wants to play piano or trumpet. He is on the way to advocate for himself, and my job as a “speech therapist” is over. I am just a mom concerned with her children’s well-being. I was once told by a wonderful mother that “the sky is the limit” for our implanted children. But in France in 2012, Auditory Verbal Therapy is still not an option for parents, bilateral cochlear implant surgery is not commonly available, MAPping a cochlear implant in France is a fight, and most audiologists don’t seem to focus on getting the best performance. We still have a long way to go. Matthieu recently told me that he’d like to build a staircase to climb to the moon to talk to it. I believe he can do it, because thanks to those wonderful people abroad, he has already reached the sky. While Caroline Pisanne stated that her job was over, of course she continues to advocate for Matthieu. Now that Matthieu is mainstreamed, Caroline is working with the school system to provide Sound Field Systems in the classroom. Read about it here!